Shimano 2015 Metanium DC is the best performing bait caster for all of anglers. It is ultra light, and super smooth, and you may focus on signals from fish. Casting with Metanium DC is quite easy. The state o arts i-DC5 brake system casts very smooth for long. Its body construction is combined with magnesium alloy body frame and CI4+ engineering carbon material side plates to achieve light-weight and solidness. 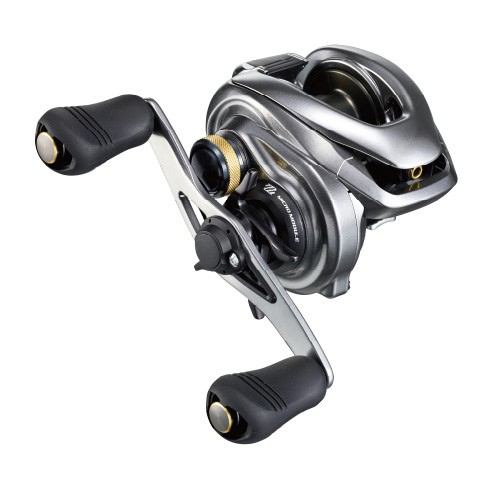 It employs two innovative features to make it real arsenal for serious anglers. The first noticeable feature is the micro module gear system, which provides amazing smooth gearing. Pinion and master gear has twice the number of gear teeth than previous models, to drastically reduce the gearing noise. The second is i-DC5 computer brake system, which allows you to cast very long, longer than any other brake system. You will set line material from 3, nylon, fluorocarbon or PE braid, and choose rig weight from 4, 1: heavy 18-30g, 2: regular 10-20g, 3: light 8-12g, 4: finesse 5-8g. By setting these material and weight, it casts the longest without any worry for birds nest. The rig weight dial also has A: full-auto setting and it covers very wide 7-30g weight for automatically and you don't have to worry about the "weight setting."